Here’s a new feature that all Excel users will welcome – Ideas. Ideas in Excel allows you to understand your data through high-level visual summaries, trends, and patterns. Simply click a cell in a data range, and then click the Ideas button on the Home tab. 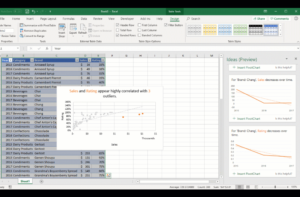 Ideas in Excel will analyze your data, and return interesting visuals about it in a task pane. Ideas works best on data in table format, so simply click into your data set and use Ctrl + T to create a table. Then, from a cell in your table click on Ideas on the Home ribbon. This is a brand new feature which is rolling out to Office 365 subscribers, so give me a shout if you need help finding out if you will get it. I can help you get onto the Microsoft Insiders program so you will get all then new features before everyone else!